When now Svenska Dagbladet (SvD, 2) put forward the argument on that “it is uncertain whether Sweden would have said yes to the US extradition-requests regarding the couple of cases that were not in Swedish territory”, the all SvD position turn out being an absurd, surrealistic misplaced, and most of all logically irrelevant for the discussion of Assange extradition to US from Sweden. 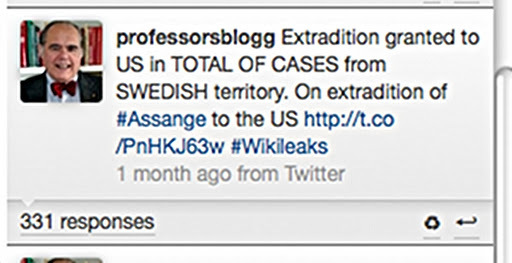 For Julian Assange in that case, he would be in Swedish territory, wouldn’t he ? Or does the author of the SvD’s article have from her Swedish Ministry of Justice another information as to where they will transport their political prisoner Julian Assange? To “Egypt”? Regarding the open extradition requests from the USA since 2000, Sweden has granted such extradition in the TOTAL OF CASES in which the prisoner was in Swedish territory. This is (naturally, because we are basing on figures from the same original source: The Swedish Ministry of Justice) exactly the same statistics that Julian Assange referred in his interview with TV4-Sweden. And he is telling of the possibilities of extradtion to US, of course in the assumption that he will be kept in Swedish territory! In their ever pursue of discredit ad-hominem Wikileaks founder Julian Assange, the Swedish establishment’s right-wing newspaper Svenska dagbladet today clearly insinuates new ungrounded accusations against Assange. The article series, arrogantly formulated as a lecturing to Julian Assange, states directly that Julian Assange would have provided wrong information to the Swedish viewers of Channel Four (TV4) about the actual extraditions prospective to US, in case Sweden would be requested by the US. The series consist in two articles published by SvD 22 December 2011 – with exactly the same ”information”. One article – in English, unsigned – is headed ”Assange (affirms that): Sweden has accepted every single (US) demand”; the other article, originally in Swedish and signed by reporter Karin Thurfjell is headed ”Assange (affirms that): Sweden has not opposed USA during the 2000’s”. The SvD piece should be view it also as a new attempt of draw focus on the “formalistic” or juridical aspects of the extradition-case, away from a political analysis. For both the reasons and eventual solutions of the extradition risk resides in political decisions. Secondly, not a word in the SvD article on the real lethal peril for the WikiLeaks founder in connection with the extradiction risk to the US, in the context of the serious death treats and the like formulated by some prominent figures. However, in order to infer that Assange would be mistaken, Svenska dagbladet (SvD) felt obliged to put up a deceptive argument, as I probe here below. And in this case is not a matter of how to interpreted statistics. It is nothing of the like. It is however purely a deceptive, misleading argument. Secondly, SvD avoids referring in the article to other forms of extraditions to USA that Sweden has used during the same discussed period (2000 onwards). Namely, the extraordinary renditions of political prisoners perpetrated in clandestinely by Swedish security police on behalf of CIA officers. For these severe criminal deeds Sweden was sanctioned by the United Nations, as Sweden was found guilty of violating the absolute ban on torture approved by the organization. Yet, other forms of likely extradition to be used by Sweden are described in the chapter Extradition to the United States in the site Justice for Assange (formerly Sweden Versus Assange). 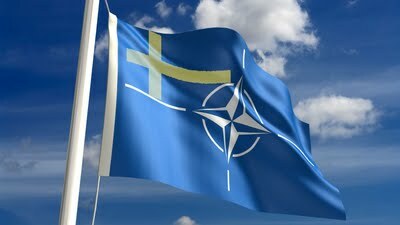 In the main context, what is real at the stake in the international discussion is not “if” but how much have really Sweden converted from a sovereign nation – with a proud and dignified Neutrality towards superpowers – to become a servile vassal of the USA in a variety of spheres (militarily, geopolitically, culturally, etc.). To give a picturesque touch to these lines: the semi-official publication “The Local” (financed by the Swedish public funds called “Longtagarfonden”) informs proudly the international reader that Sweden can now boast being Number One as the country in the world with most MacDonald-establishments per capita! Nevertheless, as relevant background on the actual vassal status under USA that Sweden has positioned by own will, concretely regarding the case WikiLeaks/Assange, please do read the summary This is Why. To the facts on the discussion about extradition statistics of these last weeks. “According to a recent interview with Julian Assange and lawyers Jennifer Robinson and Geoffrey Robertson , the USA shall most certain seek the extradition of the Wikileaks founder. The reason – as mentioned in the interview – being that a US Grand Jury investigation has been on-going in Washington since last year – preparing aggravating charges on espionage. Such charges, most likely in connection with the Wikileaks Pentagon-disclosures, would entail for Julian Assange “up to ten-years in a maximum security prison”, according to the legal experts. Meanwhile, a recurrent misconception – or deliberately misinformation – published in the international media, is to consider the deportation of Julian Assange from Sweden to the USA as, statistically speaking, “highly unlikely”. A deepening text with a rationale for the above in the same article under heading About the myth that “Assange’s extradition from Sweden to the US is not likely”. I based my statistical calculation in information from Sweden’s Justice Ministry given in an AP report of the 6 of February 2011, extensively commented in my article. This is (by no coincidence, because we are referring to the same source: The Swedish Ministry of Justice) exactly the same statistics that Julian Assange is referring in his interview with TV4-Sweden. And he is telling of the possibilities of extradtion to US of course in the assumption that he will be kept in Swedish territory! When now Svenska Dagbladet (SvD) put forward the argument on that “it is uncertain whether Sweden would have said yes to the US extradition-requests regarding the couple of cases that were not in Swedish territory”, the all SvD position turn out being an absurd, surrealistic misplaced, and most of all logically irrelevant for the discussion of Assange extradition to US from Sweden. For Julian Assange in that case, he would be in Swedish territory, wouldn’t he? Or does the author of the SvD’s article have from her Swedish Ministry of Justice another information as to where they will transport their political prisoner Julian Assange? To “Egypt”? On several earlier occasions Assange has also said that he fears being passed on to the US if he were to be extradited from Great Britain to Sweden. According to the Swedish Justice Department the total number of extradition demands from the US since the year 2000 is six. Sweden has said no twice, both times because the person wanted by the USA could not be found. If he had been found the authorities would subsequently have considered if he were to be extradited or not. It is thus not clear what would have happened if the persons had been found in Sweden. Do countries generally check the requirements carefully so that they then only file an extradition demand if they are almost entirely sure that it will be granted? “Yes”, says Nils Rekke. “They want to be sure in order to avoid a rejection. Just as we do not want to waste time and effort trying to get another country to extradite someone at the same time knowing that it is against the laws of that country. That is a pointless effort”, Rekke says. So there may be cases where the USA has wanted to have someone extradited, but after having received an informal no, have refrained from sending an application. One way of making an informal inquiry is to declare a person wanted through Interpol, which means that one country asks of any other country to have the individual extradited if he or she is found. But if Sweden has objections against an extradition,that would most probably mean that the US would not file a formal request. However the Swedish National Police Board has no statistics on how many times the US has used Interpol to search for someone who has eventually been found in Sweden, but not been extradited. Therefore it is not possible to ascertain with certainty if the USA has wanted to have someone extradited but refrained from making a formal application. The claim that Sweden has not said no to any US demand for extradition since 2000 is not correct. However in the cases where Sweden has not extradited a person it has been because this person could not be traced which make an extradition impossible. It is thus possible to argue that Sweden never actively has objected to a US application in the Noughties. That is why Assange gets an amber light. It could also be the case that the US actually has wanted persons extradited, but never made a formal demand knowing that it would not be accepted. According to Nils Rekke this is commonplace. Assange wanted to make the point with his statement that there is a high probability of being extradited from Sweden to the USA if there is an American demand. That statement is misleading since it does not take into account how extradition cases are handled. December 22, 2011 in Uncategorized. "Furthermore Assange is presently not charged in the US with any crime and to be able to try to have him extradited the United States must charge him with a crime that carries a minimum sentence of two years both in American and Swedish law. "Hold it. Stop the presses. Is it just my imagination or is this a roaring hypocrisy on the part of the Swedish government? I mean to not allow an extradition from their country unless the person has been charged in the extraditing country, but be totally fine with demanding Assange's extradition when he has not been charged with a crime anywhere in the world, much less in Sweden, the country demanding his extradition.